The Sambava Panther Chameleon is the most common sub species of panther chameleon partly because it has some outstanding colors and a wide range those colors as well. The blue sambava panther chameleon (Furcifer pardalis) is a sub-species of panther chameleon found in the eastern and northern parts of Madagascar in a tropical forest biome. Additionally, it has been introduced to Réunion and Mauritius. Either red with blue bar, Green with blue bar, Blue with Red Bar, even whites and yellows are seen in blue Sambava Panther Chameleons. 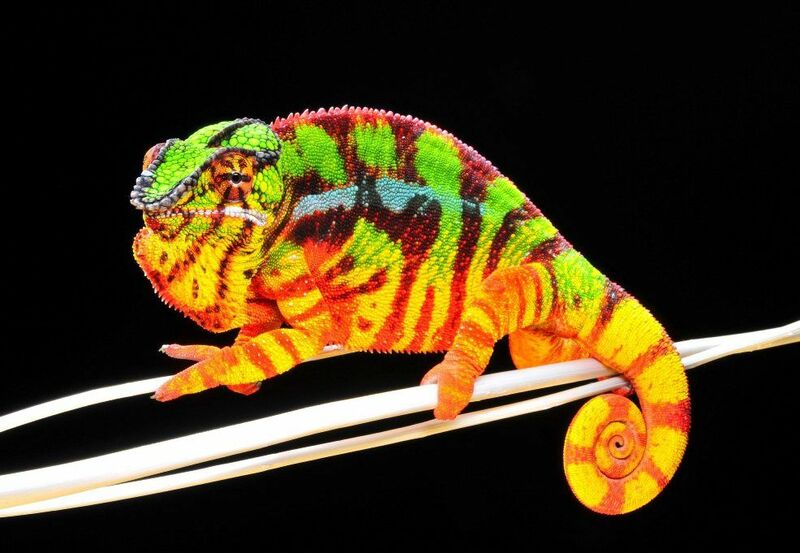 Our Sambava panther chameleon lines are 100% captive bred and have a variety of KammerFlage as well as Tree Candy and Canvas Chameleon founder lineage. The panther Chameleon is easily the most gorgeous colored and easiest to handle of all species of pet chameleon for sale. Panther Chameleons for sale are fairly docile and males are known for being even “friendly”. It is not uncommon for male panther chameleons to venture to your arm when you come to their habitat to feed them. It is a common misconception that panther chameleons of any kind can change color to match any color of their environments. All chameleons have a natural color range with which they are born, and is dictated by their species. It is affected by temperature, mood, and light. If, for example, the color purple is not within the range of colors to which their particular species can change, then they will never turn purple. Panther chameleons are at the top of the list when it comes to care requirement but if set up correctly (correct Misting system, correct UVB lamp, and Hot spot, with plenty of foliage and climbing apparatus. A Panther chameleon can make a great first time chameleon keeping experience. Panthers do not have extreme care needs like others in the chameleon world. They can adapt to changes in temp and humidity much better then most other chameleons can. For this reason Panthers should not be over looked just because of there price. A captive bred Panther will be much hardier then any WC chameleon out there. As with all of our reptiles for sale, all of our Sambava panther chameleon for sale come with our live arrival and 7 day health guarantee. With a biologist on site, you can shop with confidence that we will be there to offer support and help you with anything you need along the way. All of our reptiles for sale ship via FedEx or UPS overnight in heated or cooled insulated shipping containers and leave our facility around 7pm the evening of shipment and arrive at your doorstep normally before 10:30 AM. If you are searching for the perfect baby, juvenile or adult panther chameleon for sale, our sister site CBReptile.com has an even larger selection of panther chameleon for sale, including ambilobe panther chameleons for sale, ambanja chameleon, Nosy be panther chameleons, baby veiled chameleon, adult veiled chameleon, and baby panther chameleons.